The Governor of the State of New Mexico is the chief executive of the state of New Mexico. The governor is the head of the executive branch of New Mexico's state government and the commander-in-chief of the state's military forces. Responsibilities include making annual State of the State addresses to the New Mexico State Legislature, submitting the budget, and ensuring that state laws are enforced. The officeholder is afforded the courtesy title of The Honorable for life. The current governor is Susana Martinez, a Republican. Martinez won the November 2010 gubernatorial election and was sworn in as the 31st Governor of the state of New Mexico on January 1, 2011. She is also the first elected female governor of the state. 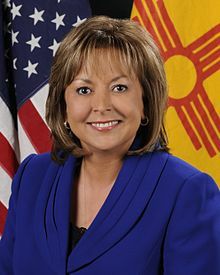 Governor Susana Martinez' "New Mexico True Story"
New Mexico governor Susana Martinez spoke to the Republican National Convention Wednesday night, addressing the need for a real debate on the issues.